Alabama announced Wednesday it placed 56 student-athletes on the 2011 fall SEC academic honor roll, the second highest total in the conference, according to a press release. Alabama led all SEC schools with 38 football players from its 2011 national championship team. The school noted key players such as 2011 Heisman Trophy finalist Trent Richardson, Outland Trophy winner Barrett Jones and national championship start place kicker Jeremy Shelley, among others. Student-athletes needed a 3.0 GPA or better "for either the preceding academic year, or their career and be a sophomore or better in academic standing," according to the release. 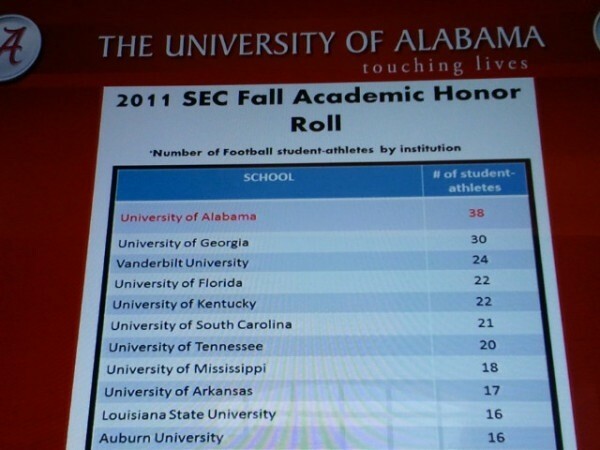 The fall honor roll is based on 2011 spring, summer and fall academic sessions. Click here to see the full list, via al.com's Izzy Gould.